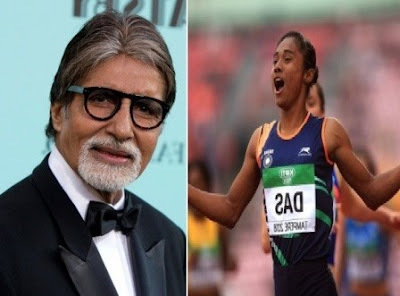 Bollywood Celebrities like #AmitabhBachchan, #FarhanAkhtar, #ArjunRampal and #TiscaChopra are congratulating 18-year-old sprinter, #HimaDas, who just earned India's first-ever track gold at the #IAAF World U-20 Athletics Championships. Hima Das is an Indian sprinter. She is the first Indian track athlete to win a medal at any global event. Hima Das won gold medal in women's 400m at World U-20 Championships 2018 at Tampere, Finland, Clocking a time of 51.46 seconds.